A new boardwalk at the popular Moose Bog will provide additional opportunities for people to see wildlife in Vermont’s Northeast Kingdom. 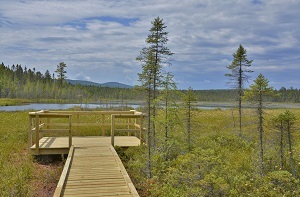 The boardwalk, which was built to comply with the Americans with Disabilities Act, provides an immersive experience in nature at the Wenlock Wildlife Management Area in Ferdinand, Vermont. The project was completed by the Vermont Fish & Wildlife Department and Vermont Department of Forests, Parks, & Recreation using labor from the Northwoods Stewardship Center. A financial contribution from the Northeast Kingdom and Ammonoosuc chapters of the Audubon Society in Vermont and New Hampshire will fund the cost of interpretive signs which will be built this coming winter. Morin cautions that while the crew worked to make the trail comply with national ADA standards, it is still a one-mile round trip and involves some elevation gain, so the full trip may not be appropriate for everyone. Visitors can also enjoy other nearby ADA-accessible state lands at Sentinel Rock State Park and Brighton State Park.